Electric scooters have hit the streets of Brookline. A woman fell over and injured herself during Brookline's electric scooter pilot program launch on Monday morning. 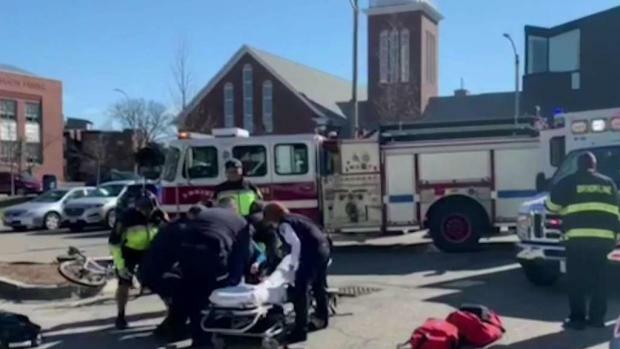 Emergency crews say the woman, who was wearing a helmet, will be OK after falling over while using the e-scooter outside of Brookline's Town Hall. The town launched its five-month pilot program for electric scooter companies Bird and Lime in an effort to give the community another transportation option. The program makes Brookline the first Massachusetts town or city to welcome e-scooters to its streets. "Our hope and expectation is that it will, and will be a successful program once we see the demand," Hachem Alaoui Soce, Lime's Northeast general manager, said in a statement last month. A woman was hurt Monday morning during the launch of the electric scooter pilot program in Brookline. The scooters for both companies work with an app you can use to rent the means of transportation. About 200 scooters will be deployed in Monday's launch. The e-scooters can drive at speeds up to 15 mph. Officials urge drivers to use the scooters in bike lanes and to not use them on the sidewalk. "Fifteen miles per hour doesn't seem like a lot but if you accidentally accelerate all the way and you haven't put in the time and energy to use it responsibly it can shock you how fast that feels standing on something that's a little wobbly. So take it slow, learn how to use it," said Brookline selectboard member Heather Hamilton. Bird launched scooters in Cambridge and Somerville last year, but they were taken off the roads after officials in both cities issued a cease and desist letter. Authorities said the company never got a permit to conduct business and violated sidewalk safety laws.